While this week has been a little warmer than last, it has still been bitterly cold, and we've had a covering of frost on most mornings. 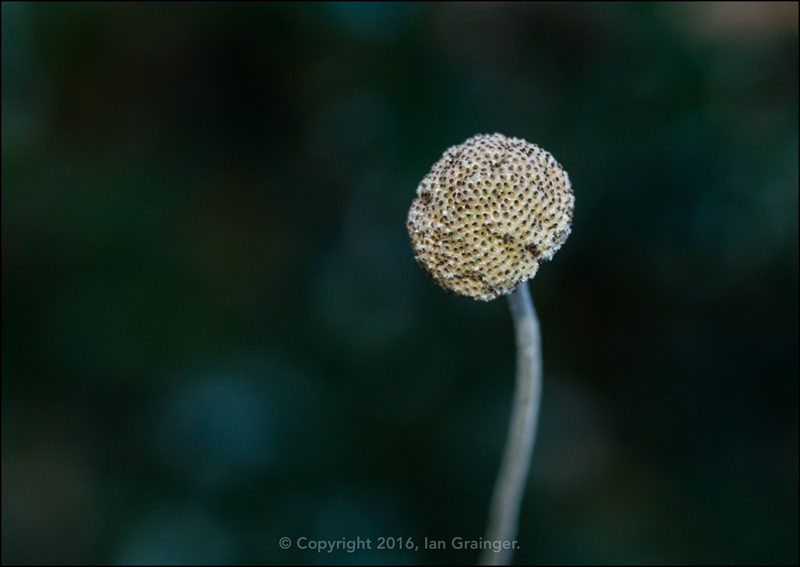 This week during my photo shoot however, the frost didn't budge at all, and remained in the garden all day. Whilst I'm not a great fan of frost (or snow), it does have a way of making even the most mundane of subjects look prettier than usual. This otherwise sad looking brown decaying Cherry Tree leaf being a good case in point. 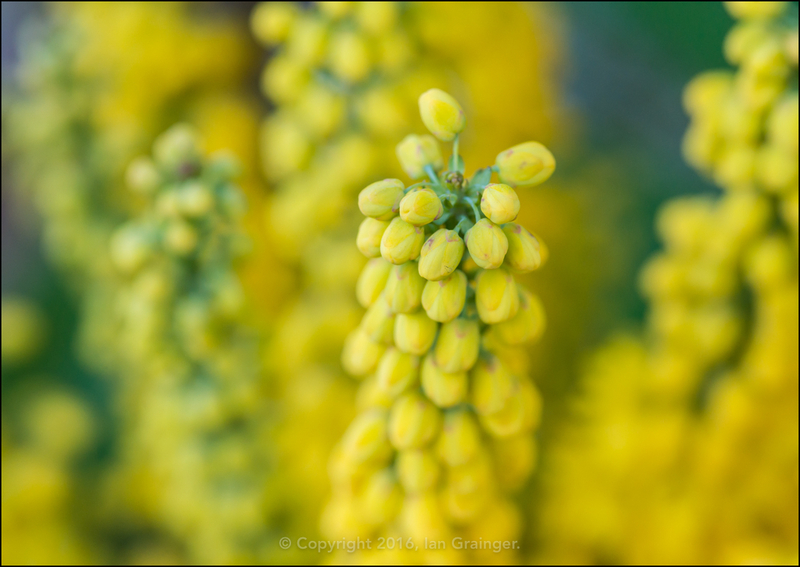 Despite the cold weather, the Mahonia Japonica bush is looking resplendent, and is covered in yellow buds and blossom, and is definitely brightening up dad's front garden. 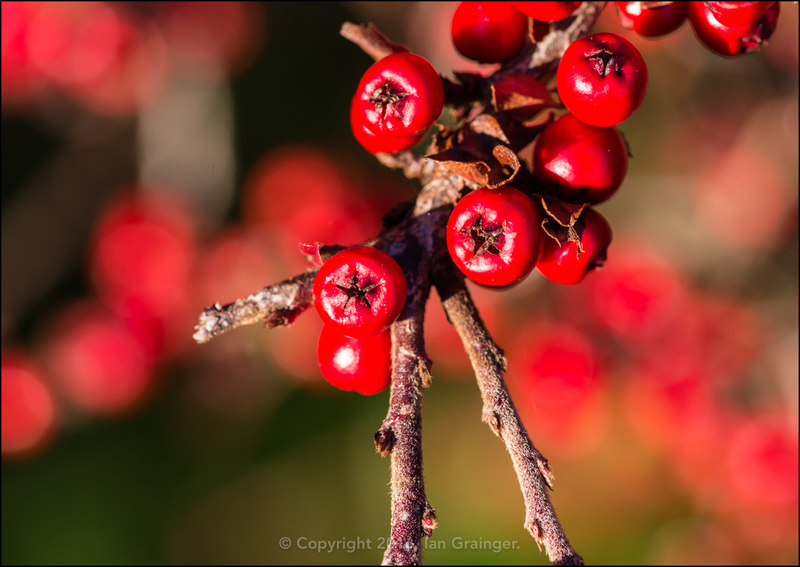 Also looking very good are the bright red ripe berries of the Cotoneaster bushes. 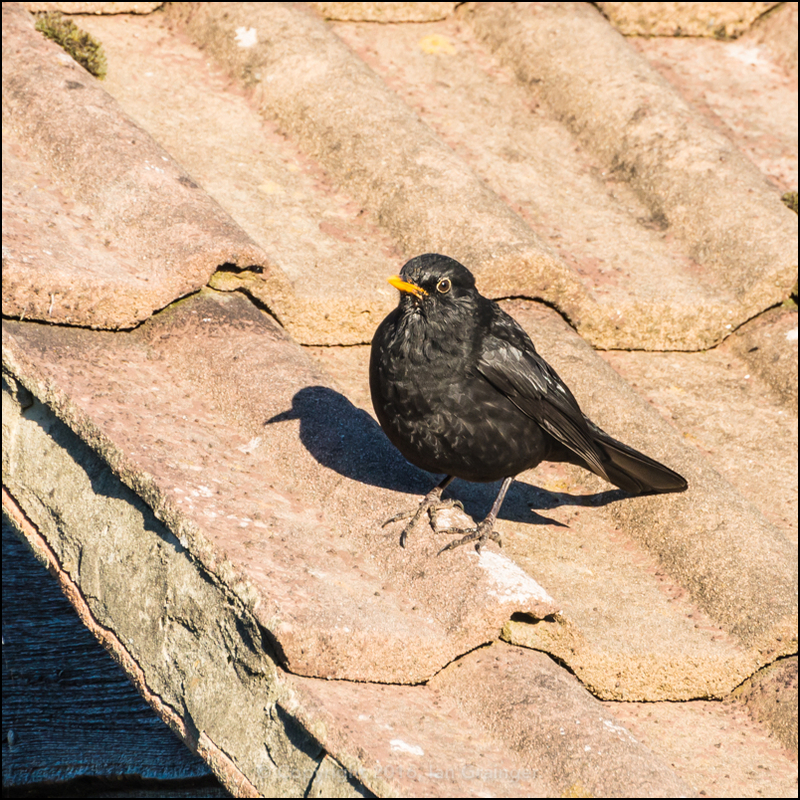 I can't see them lasting much longer as the Blackbirds have been eyeing them up for a few weeks now! 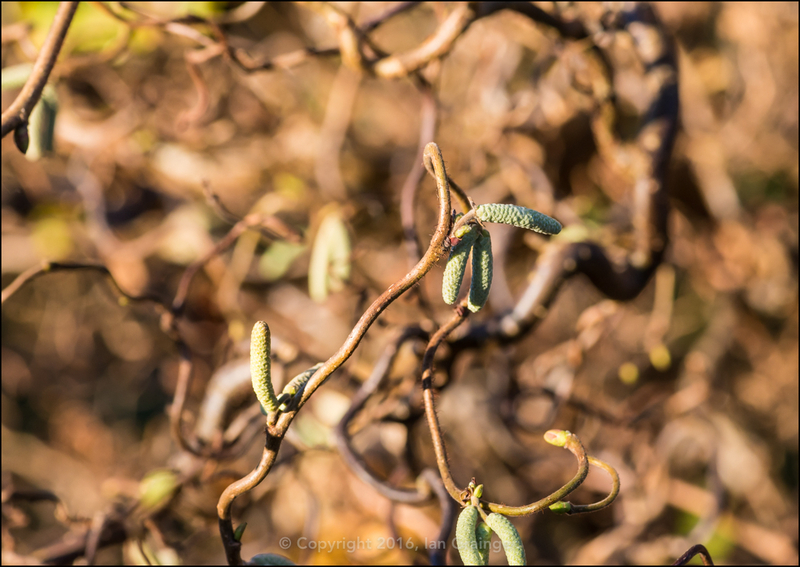 ...and now that the Corkscrew Hazel (Corylus avellana contorta) tree has lost all of its leaves, you can really appreciate how it got its common name. 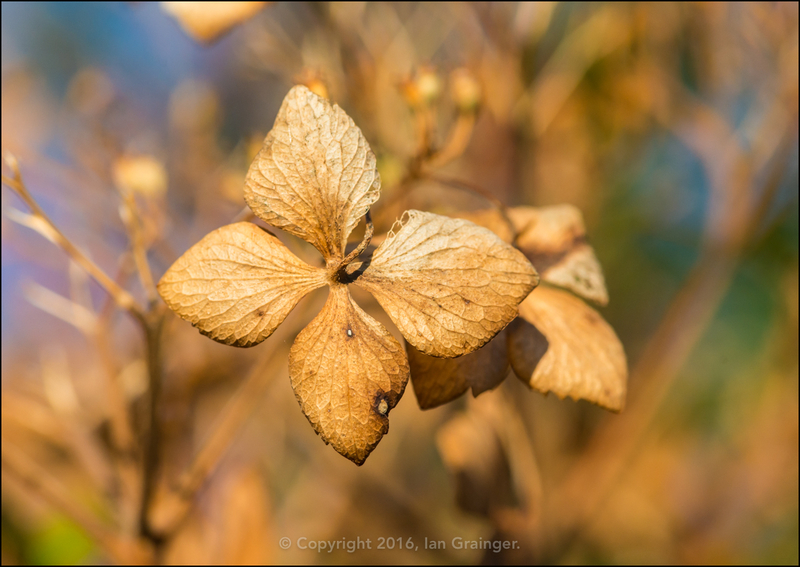 The Lacecap Hydrangea (Hydrangea macrophylla) bushes are really taking to their autumn coat of decaying bracts. While many cut the flower heads as soon as they start to wane, I like to leave them as they add interest all through the late autumn and winter months. 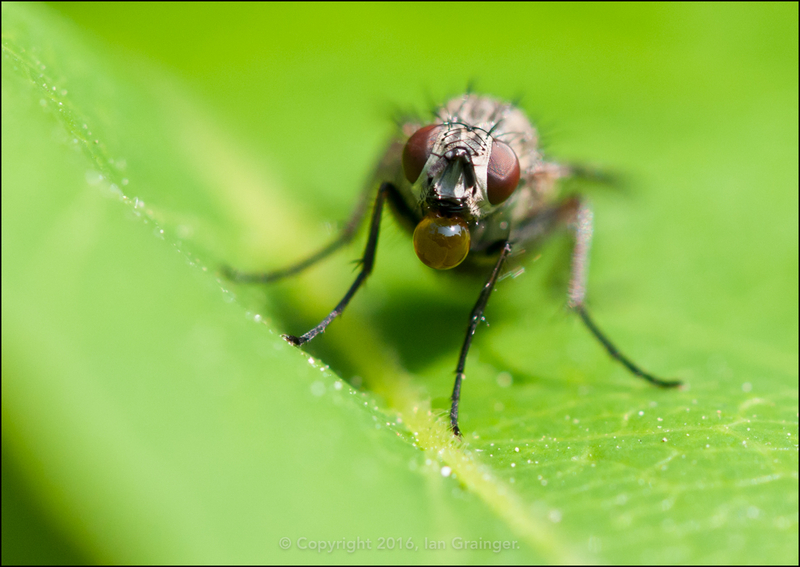 Something I wasn't expecting to see with it being so cold was an insect, and certainly not one blowing a bubble! 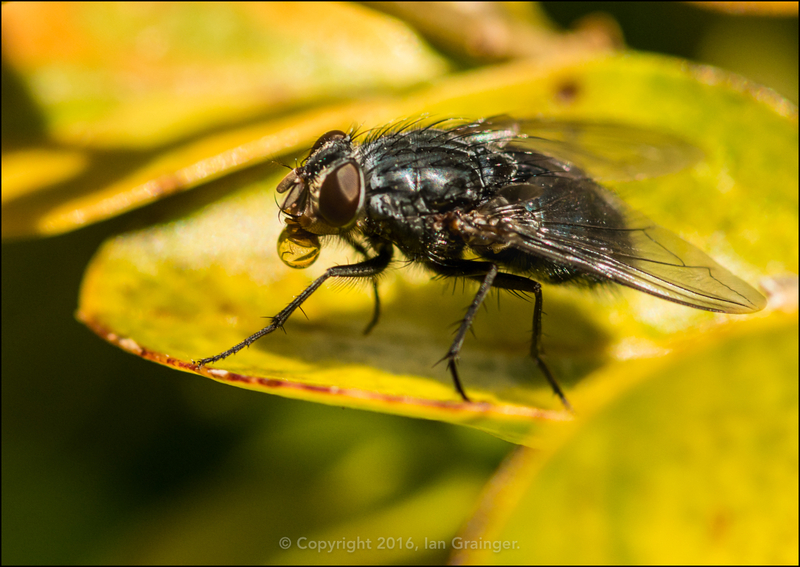 I've seen this behaviour in Flies (Diptera) before (see below), and have tried to research the behaviour, however, there doesn't seem to be any consensus of opinion in the scientific community that explains it. 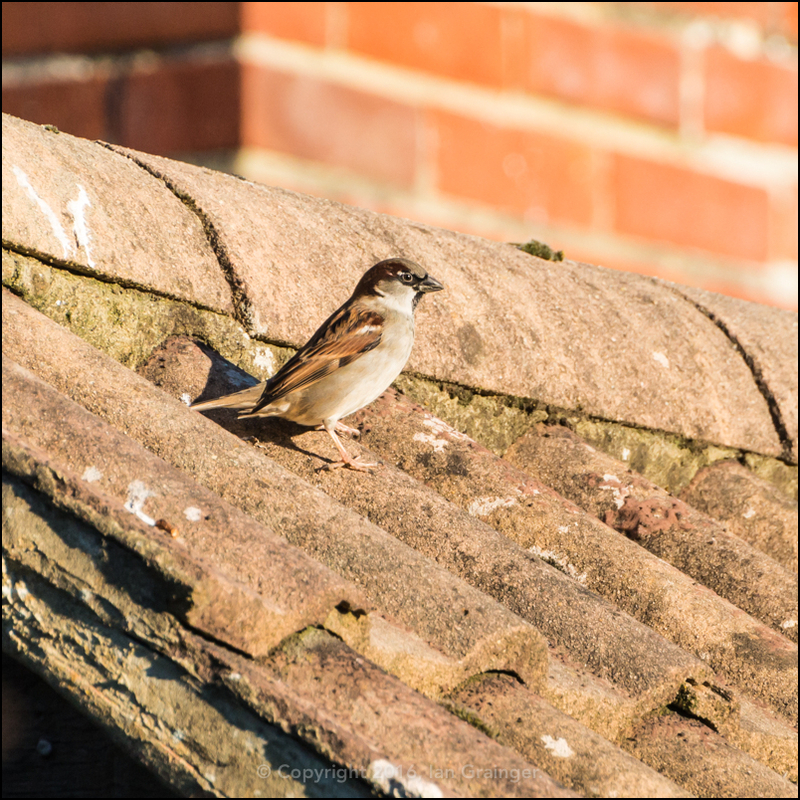 Some of the theories at present range from them trying to expel excess water from their systems, or them trying to warm the fluid in the sunshine to raise their body temperature, or maybe they just have a cold? 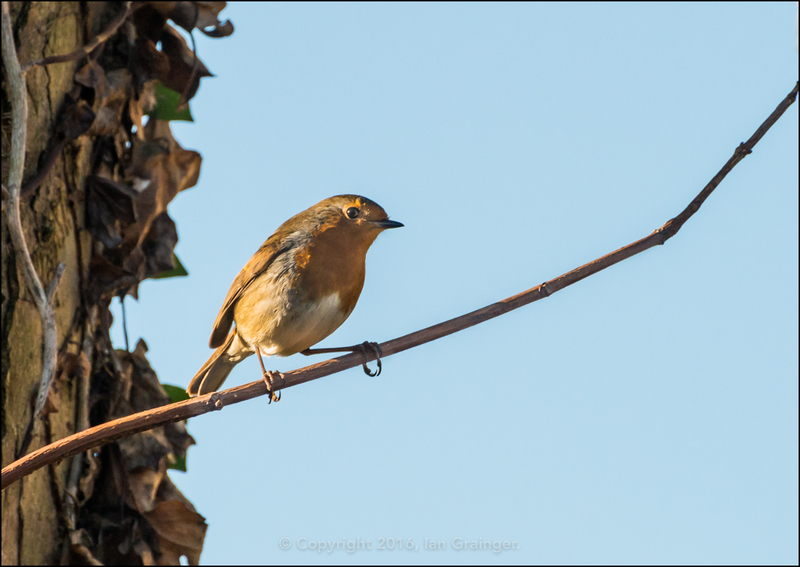 A much less gross subject, and much prettier, was this Robin (Erithacus rubecula). 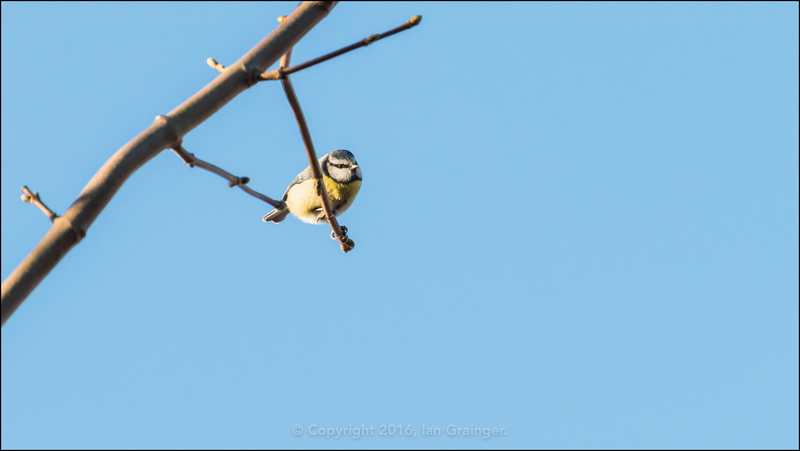 He wasn't quite as friendly as the one that keeps me company in my own garden, but at least he picked out a nice perch to sit on while I photographed him. ...and when I followed his flight I found out what it was. 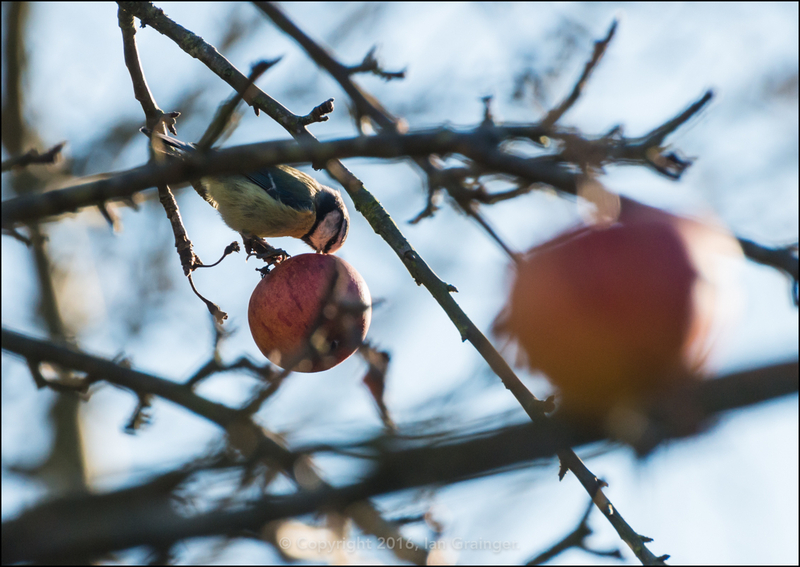 A big juicy apple! 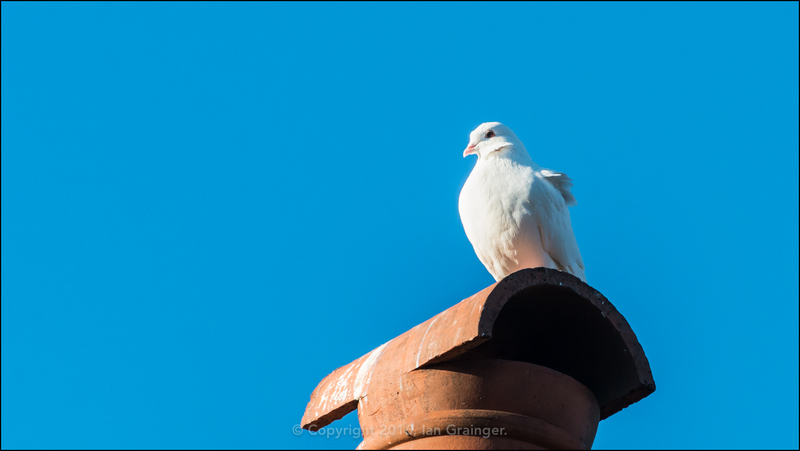 ...and this rather unusual white Feral Pigeon (Columba livia) had joined the regular flock that gather on the rooftops. 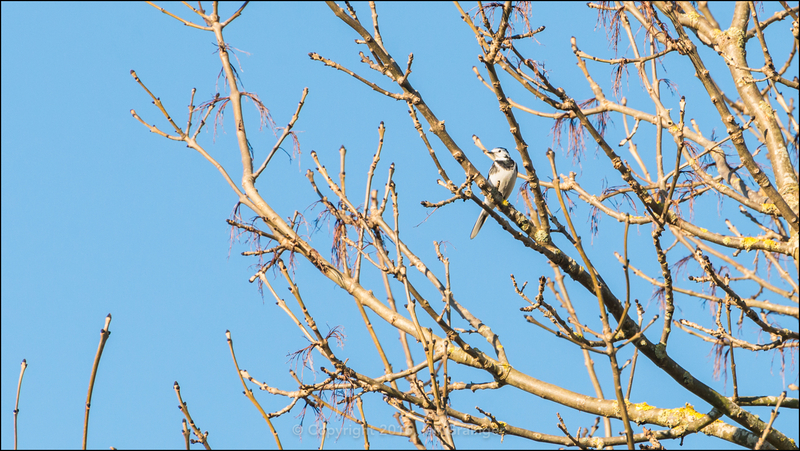 There were also a pair of Pied Wagtails (Motacilla alba) flitting about from tree to tree, and enjoying the early morning sunshine. 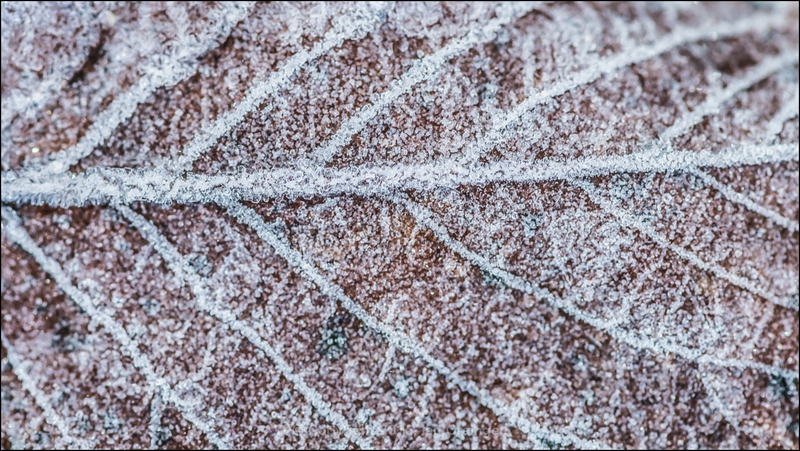 Frost on the floor meant my trusty photo friend remained indoors again this week. 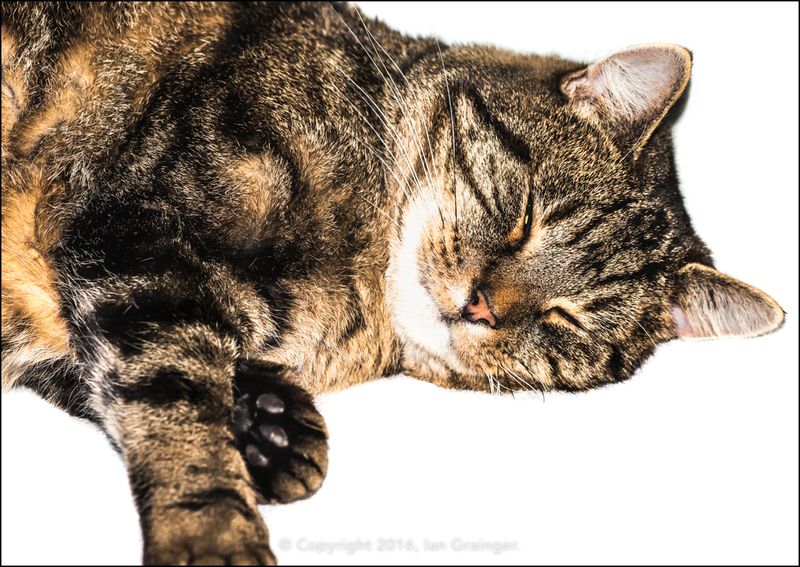 In fact he's getting quite used to lying on the white backdrop sheet I use for portrait and product photography. So much so that it's now almost useless as it's covered in fur!